There was nothing that could stop Matia and Katia from forever. Despite a little rain, the lovely couple, together with their family and friends, were still in high spirits and were all smiles during the big day. The weather didn’t spoil anyone’s mood and the celebration went on. 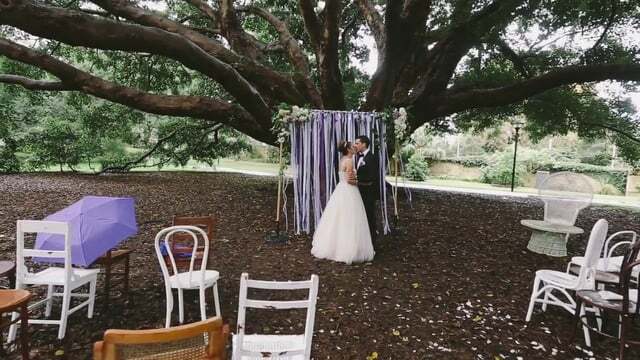 Onsight Films got to shoot many special moments, and the their Sydney wedding video turned out to be wonderful. We couldn’t be happier for the couple. The Pavilion, with the beautifully enormous tree serving as the backdrop, was the perfect place for Matia and Katia to exchange vows. It was truly picturesque and we had a great time filming the entire ceremony. The pops of purple all throughout the venue – from the tassels, balloons, flowers and umbrellas – it provided the perfect touch of colour that livened up the location, as well as the mood. It made the ceremony as colourful and as vigorous as the love that the couple clearly had for each other. It was a great pleasure to have captured the couple personally sharing their love story, from the first meeting up until the proposal. It was also a privilege to film the start of their new life together as husband and wife, including the touching speech Matia shared for Katia and the beautiful Italian song Katia performed for Matia. As a Sydney wedding videographer it’s always a great experience freezing these memorable moments for the couple to keep and treasure for decades, and this wedding was no exception. Even though the sun wasn’t shining as they expected, everything still fell into place. Matia and Katia decided on forever, and what a forever it will be!